American identity has become our identity, at least if you consider our obsession with it (not reciprocated) and the fact there’s no discussing Canadian identity without relating it somehow to our neighbors. Hard to imagine Italian identity, for example, wrapped up in the question of what Switzerland thinks. Constricted by the leg irons of defining a national identity in a place defined by what it isn’t, is it even possible to make universal claims about identity through art, and especially art as maligned as the horror film? 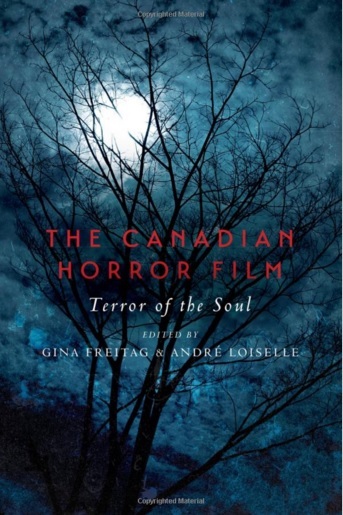 The authors of The Canadian Horror Film: Terror of the Soul attempt to do just that, a daunting task that they’re mostly more than up to. We hail from a land of cultural protectionism – almost a necessity given a wide swathe of underpopulated geography, mostly huddled within ear and eyeshot of American popular media, snowed under by its popular culture. The National Post even held a debate about whether Rush would’ve succeeded without government regulation of domestic culture. And of course, feature films deemed certifiably “Canadian” were preferentially selected-for with tax credits, and this launched our domestic horror film culture: the infamous Tax-Shelter Era that spawned faves like Black Christmas (shot near Toronto’s Casa Loma), Prom Night (filmed at a high school in Toronto’s east end) and, My Bloody Valentine (lensed in Sydney Mines, Nova Scotia). There’s been much ink-letting when it comes to those, so it’s great that a book such as The Canadian Horror Film goes for the deep cuts, looking at a broad ribbon of horror subject matter including eco-horror, the Canadian landscape, the tax shelter era and of course, the inescapable presence of Cronenberg – some of which is admittedly mystifying to anyone not holding a Canadian passport, but luckily, enough to chew on for goreheads regardless of nationality. The Canadian Horror Film includes a discussion about the quietly intimate relationship between a radio host and his listeners in Viral Culture: Canadian Cultural Protectionism and Pontypool. It’s a film with a denouement that left non-Canadians cold, but took on a special resonance with us. This piece, by Rue Morgue contributor Andrea Subissati (aka Lady Hellbat), looks at the occasionally tense relationship between the US and Canada, and “our desperate attempts to articulate our distinction” in the face of “cultural cringe,” the phenomenon that occurs when our domestic art doesn’t seem to measure up to the stuff we’re bombarded with from Hollywood (which ironically, is inundated with Canadian cultural influence, fed back to us in a weird hall of mirrors). There’s a neat, heady discussion of the seemingly intellectually torpid Jaws knock-off, Orca. Professor Peter Thompson of Carleton University invokes the garrison mentality in his discussion, a hunkering down, collectivist impulse in the face of difficult circumstances and an unforgiving wilderness, which differs markedly from the rugged individualism stateside and a desire for conquest and expansionism – the “go West young man” credited to Horace Greeley. The essay touches on East Coast politics as well as boundary transgressions (shared with Jaws) and the dramatically more interesting creature the movie focuses on, one that is more easily humanized, a la Shamu, for which there’s no analogue in the shark world. 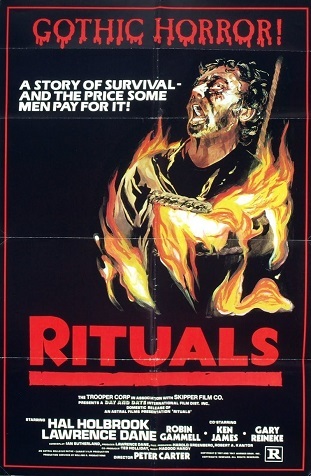 There is also an illuminating take on what is, in this reviewer’s opinion, essential Canuck horror viewing – Rituals, often derided as a low-rent version of Deliverance but which has a great deal to offer. Filmmaker Mark R Hasan explores the world of bickering doctors deep in the Ontario bush on a fishing trip who are hunted down one-by-one by a mysterious figure. The film’s put in the context of the then predominant cinema scene, which disproportionally consisted of National Film Board documentaries touting the incomparable beauty of the Canadian wilderness. It was a strong and welcome backlash against this. While The Canadian Horror Film is an offering from University of Toronto Press, don’t expect a dusty belfry in this ivory tower. This is smart, yet accessible stuff. Christopher Lombardo is co-author of Death by Umbrella! The 100 Weirdest Horror Movie Weapons and co-founder of the Really Awful Movies Podcast. This entry was posted in Horror and tagged Canadian film, Horror Movie Books by Really Awful Movies. Bookmark the permalink.